They say home is where the heart is and by the end of your visit to Cyan Icons villas, your heart will be devoted to them. 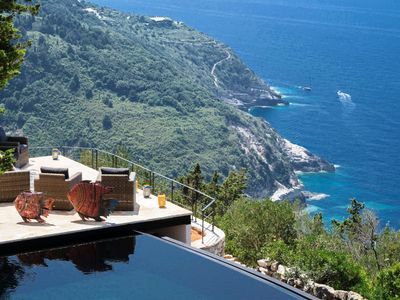 Standing on a hillside slope with a magnificent unblocked view, our 2 luxurious villas manage to combine an elegant and cosy interior with a breathtaking exterior overlooking the White mountains, also known as Madares. The calming ambience felt all around the property is a result of the love and passion put into each decorative detail. It’s an ambience that you can sense throughout your stay. Be it in the moments where you relax and breath in, the clear air or the special times you will share with your loved ones. 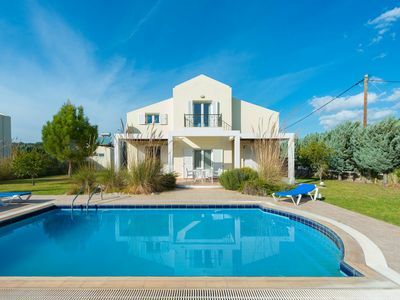 The spacious 100 m2, 3 room villas are ideal for families and groups of friends. The children friendly outdoor spaces, offer your young ones countless hours of exploring. 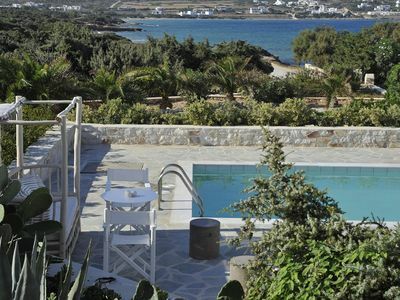 The villas also offer a pool overlooking the endless sea and the natural cornucopia of the breathtaking surroundings. Each of our luxurious villas has it’s own unique character and style, with spacious rooms, elegant details and breathtaking views. 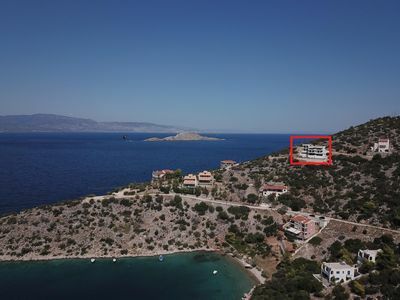 Discover a haven of exclusive privacy, comfort and relaxation, resting only 400 meters from the well hidden secret of Apokoronas, the magnificent Kera beach. 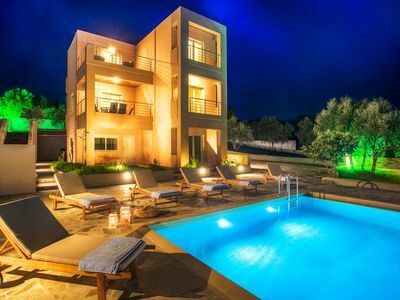 Mimis & Katina Villas, is a unique combination of coziness and creativity. It’s modern aesthetics and earthly colours create an inviting atmosphere. A mind blowing collection of books, that can astonish even the toughest book aficionados, promises to keep you company as you relax during the afternoon hours. 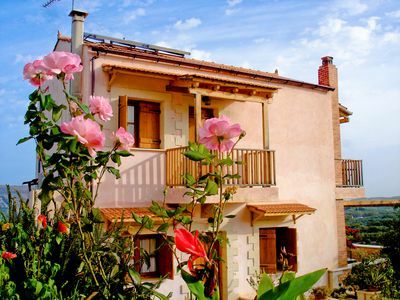 The 2 level, 3 bedroom villa offers the ideal spaces, for families with children or a group of 6 friends. 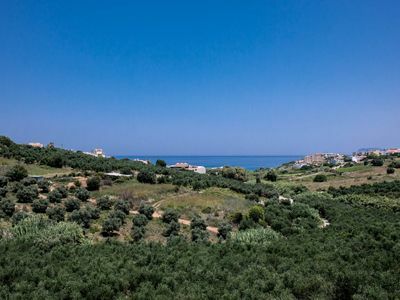 The two level villa, has a ground level entrance but as soon as you enter the house and walk through the living room, you will find yourself standing in a higher level balcony with a heartbreaking view. The uniqueness of the mountain ground inspired the architecture to design the creative unevenness of the villa. 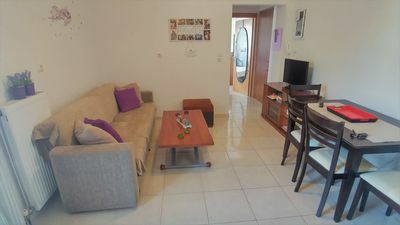 The spacious living room also offers a dining table for 6 people, where you and your loved ones can enjoy the local delicacies you will create in the fully equipped kitchen with fridge/freezer, oven/hob, dishwasher, coffee machine, toaster etc. The picturesque view of the sea and the mountains, is extremely welcoming and promises to offer you unforgettable memories! 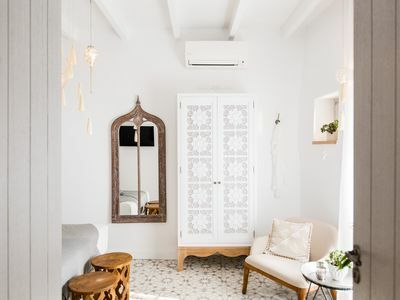 The comfortable ground level bathroom incorporates the unique character of Mimis & Katina Villas, with a spacious bathtub and a washing machine. The bedroom set on the ground floor offers 2 single beds that can be converted to a double bed upon request. Spacious wardrobes and a full body mirror add the finishing touches to the relaxing ambience of the room. The master bedroom, set on the second floor, has a comfortable double bed and a luxurious en suite bathroom with bathtub. There is also a second room with two single beds (upon request the beds can turn to one double bed) and a w.c. with shower. Fine materials, modern aesthetics and passion for detail create throughout the floor an enchanting ambience which is emphasized by the breathtaking view of the endless sea and the mesmerizing mountains. A single glance is enough to fall in love with the beautiful outdoor space. The spacious yard is built with Karisto stones and a sloping pathway leads directly to the private pool. Comfortable sun beds welcome you to enjoy the beautiful Cretan weather as your relax under the golden Greek sun. 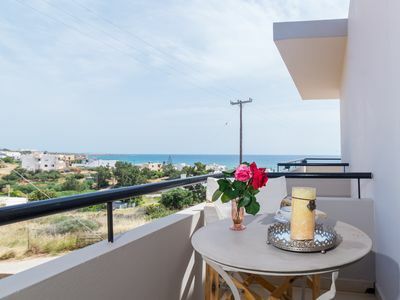 The balconies surrounding the villa offer cozy corners with comfortable chairs, ideal for reading, relaxing or simply enjoying the ambience of your surroundings. 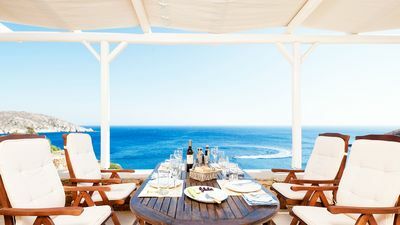 An outdoor dining table is ready to welcome you and your friends or family as you enjoy the unique tasted of the Mediterranean! The parking space of the villa can accommodate 2 cars. 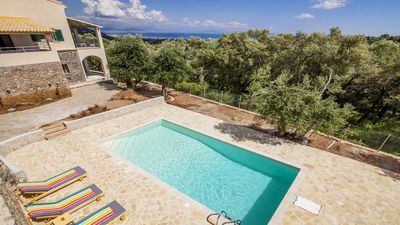 Stunning villa | North-West Paxos | Far reaching sea-view | Sleeps 10. 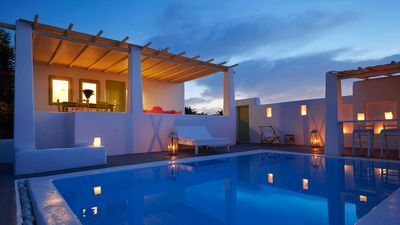 ELIA GRAND THREE-BEDROOM EXECUTIVE VILLA MYKONOS WITH LOTS OF FEATURES OF A SMART HOUSE, FROM LIGHTING TO HEATING AND TV ! 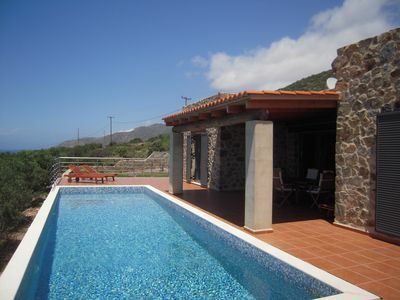 Villa Dimitra is located in a beautiful peaceful location on West Crete. 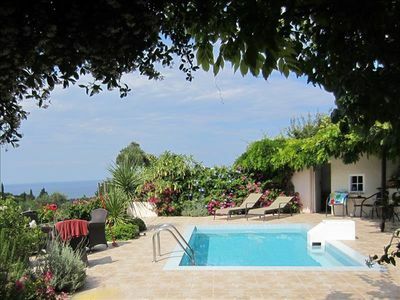 Villa Santa Maria 3, few meters from the beach, with 3 bedrooms and private pool. 5 Bed 4 bath w/private pool, car optional, free A/C, WiFi & pool towels, table tennis, DVD player, d/washer & hairdryer.